They say necessity is the mother of invention right? Yep, that’s what happened here. 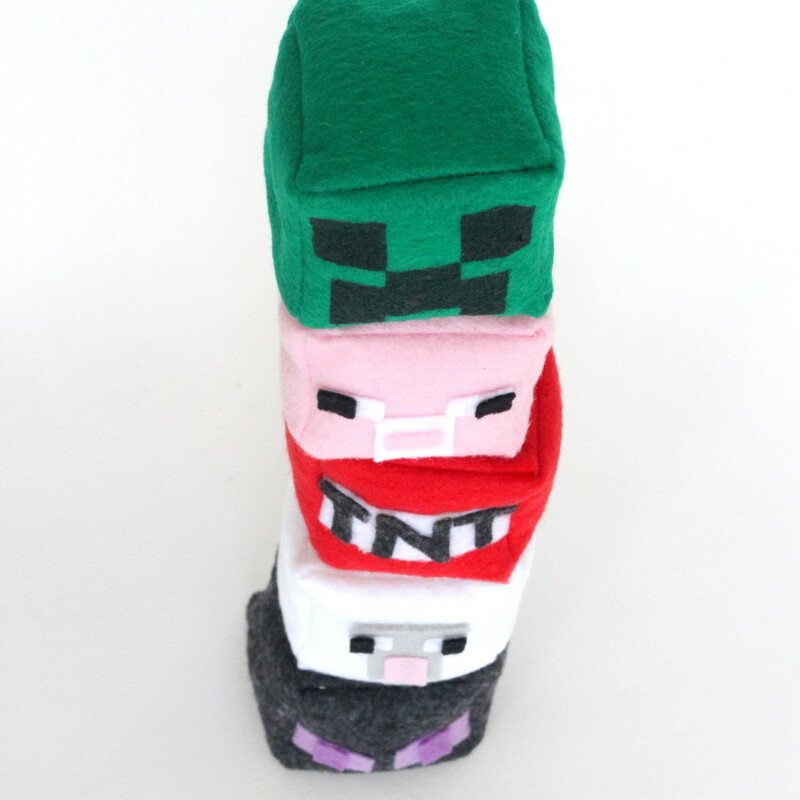 And then these little minecraft plushies were so easy to put together that I thought I’d help a sista out, just in case any of you are needing easy last minute DIY gifts for a boy (who likes Minecraft- haha). 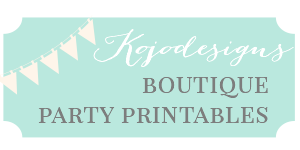 To make these, I cut a 2.5″ by 10″ strip of cardstock and also a 2.5″ x 7.5″ strip of cardstock. After folding the longer strip in half and half again (so I could clearly see each square), I stacked the two pieces to make a cross shape and then traced the template with a fabric pen onto felt. Then I cut out the felt cross, leaving an inch overhang on one square to use for securing later. It turned out to be easiest to decorate the faces/etc. 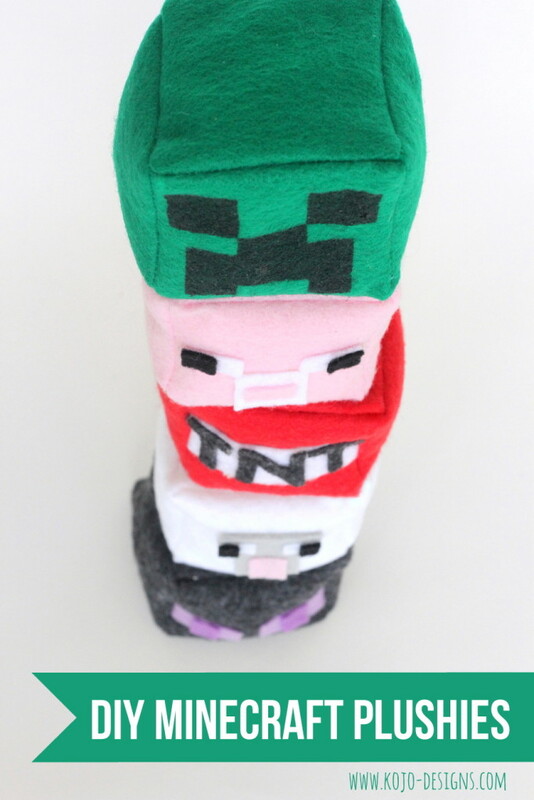 of the Minecraft characters (and TNT box) before sewing, so I did that first using hot glue as my adhesive. Then I sewed along each edge (even the edges that were already attached to reinforce the box shape) to make a box. The last edge left open was the square that had the extra tab. After turning the almost-finished felt box right side in and filling with little beans (you could also use stuffing), I tucked the tab in and hot glued the opening shut. When you say you “sewed along each edge,” do you mean you sewed on the fold? Like a sorta stitch-in-the-ditch kinda thing? Hey Sarah- I should make that more clear- yep, sew along the folds and then with the edges matched up into a box shape. Hope that helps! 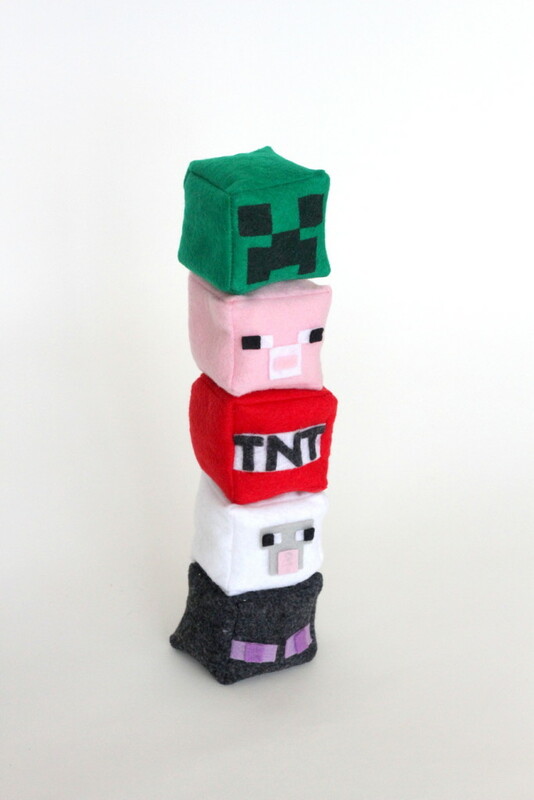 These little plushies are so cute! 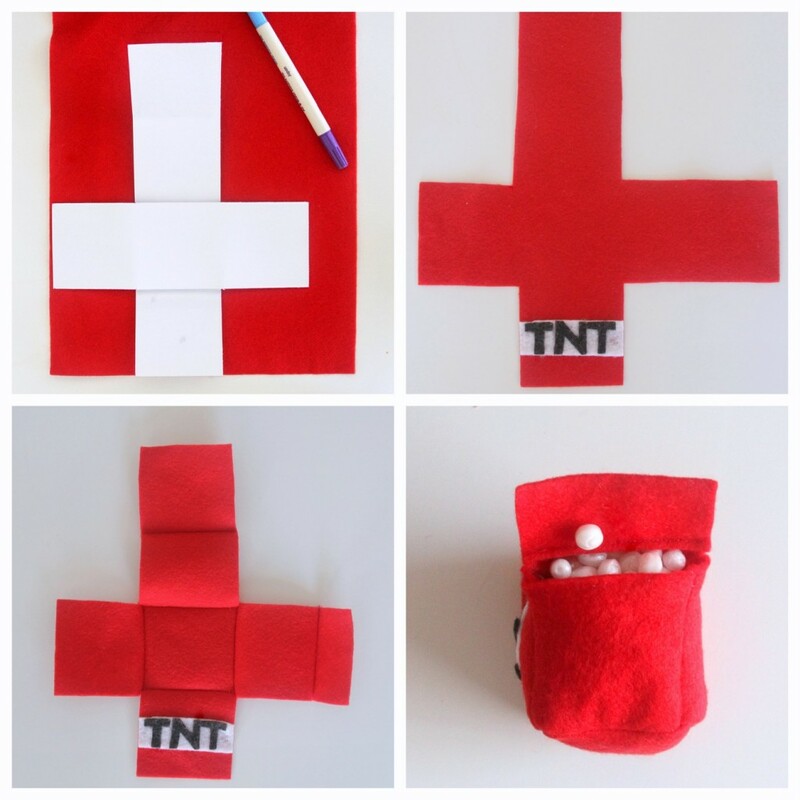 Can you do this without sewing, maybe using hot glue gun only? Christina, you probably could! I would leave a little more margin (since the glue will take up a wider amount of fabric and shrink down the square by more). If you try this, will yo let me know how it goes??? Is it okay to use your pinterest image of this post on my blog? 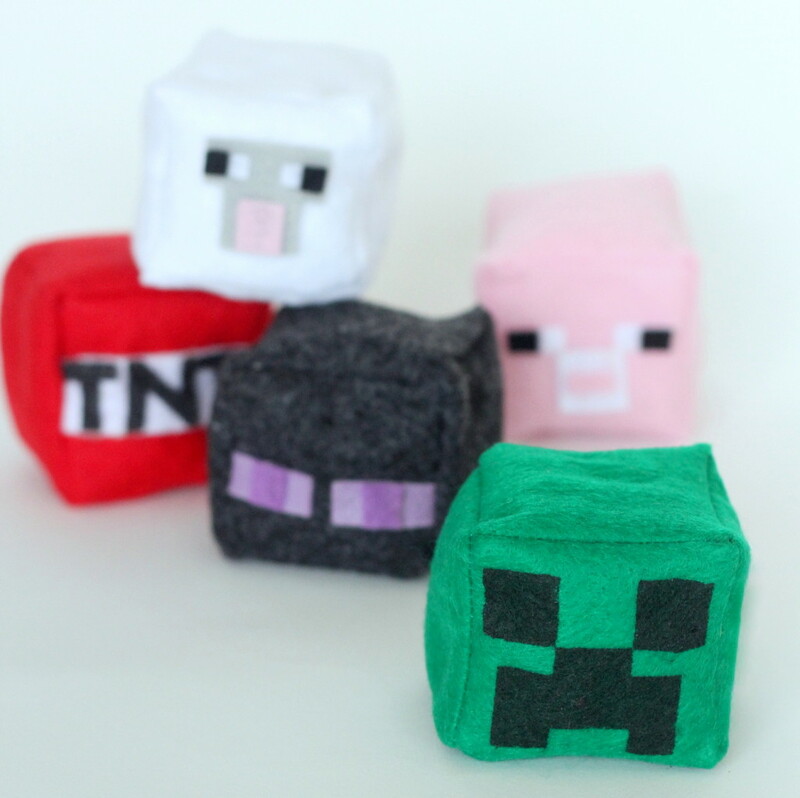 I’m compiling a list of cool DIY Minecraft related tutorials for my blog and would really like to feature you in my post. Of course I will link back to this post! Sure! Thanks for linking back!